We would be absolutely delighted if members of Do I Look Stupid? would share their insights, tips and advice so that other members can gain from them. Do take the time to share your wisdom; your website would be enriched by your contributions. 1. Only registered members would be able to contribute a post. So do register! 2. Do contribute as many posts as you like. The more, the better! The contributor’s name would be acknowledged against the post. 3. 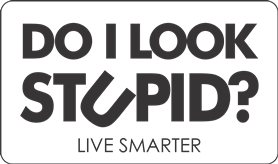 The article that a member writes will be posted on Do I Look Stupid? after it has been scrutinized. In some cases, minor editing changes could be made to take care of grammatical and spelling mistakes, to improve the flow and to delete objectionable and irrelevant portions. In a few cases, the article could be rejected if it is found to be below par or inappropriate. 4. Do I Look Stupid? will put an appropriate visual with the post. It will also recommend a book that is relevant to the topic of the post. The choice of photograph and the recommendation of the book would be at the sole discretion of the administrators of Do I Look Stupid? 5. All contributions should be original. In case a member contributes an article that has been written by someone else or has been taken from any other source, the contributing member should acknowledge the relevant source/s. Do I Look Stupid? will not be responsible in any way of any plagiarised or borrowed contributions. 6. The accepted posts will feature under ‘Big Swigs’ (contributions that are more than a 1,000 words long) or under ‘Nibbles’ (contributions that are shorter than 600 words). Contributions that fall between 600 words to 1,000 words would be posted in either section at the sole discretion of the administrators of Do I Look Stupid? 7. In case anyone raises any valid objection to a particular post, it would be deleted at the sole discretion of the administrators of Do I Look Stupid? 8. The names of members who contribute posts on Do I Look Stupid? would be mentioned in the ‘Members’ Posts’ section in descending order of contribution.